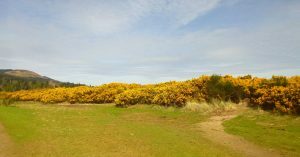 You know Spring has arrived when you walk past a gorse bush and the air is full of that delicious aroma of coconut rising from the yellow flowers in the warm sunshine. And right now the Island of Arran is positively awash with gorse. 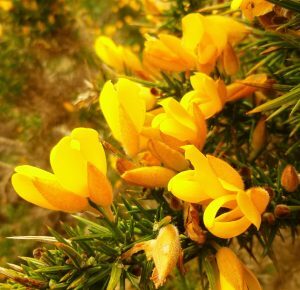 Gorse, also known as whin or furze, is native to Scotland and has proved its usefulness over the centuries. A traditional winter feed for cattle and other livestock, it would be ground with mallets or with a whin-stone, until it reached an edible consitency! Importantly, it was regularly used as a fuel, burning well even when quite green because of its high oil content. The ashes are rich in alkali and gorse was often burned off to improve the quality of the land. These alkali-rich ashes were also mixed with animal fat to make soap. And it’s a sanctuary for small birds, who can hide safely inside this thorny shrub. 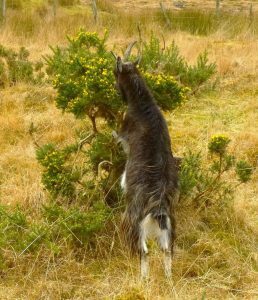 On the other hand, there are few things worse than fighting your way through gorse that has been allowed to grow unchecked – then those spikes become just too vicious. But, on the whole, gorse has been a friend to farmers and crofters and fitted in well with rural life in this country. Unfortunately the same can’t be said of the rampant rhododendrons that grow unchecked in so many parts of Scotland. In the right setting, as in the gardens of Brodick Castle, rhododendrons flourish alongside other exotic plants that were brought here in the late 18th and 19th centuries to fill the gardens of the new, fashion-conscious, owners of country houses. 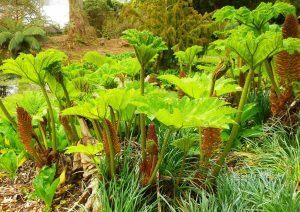 In Brodick Castle grounds you’ll see American skunk cabbage (with its very curious smell) and Gunnera (looking for all the world like enormous rhubarb) arranged to create areas of great interest. However, as the management of many large country estates has declined, their gardens have been left to run wild. As a result, some of these non-native species have been allowed to escape and are now too rampant, too invasive, and are causing wide-spread difficulties. In particular that ‘Victorian monster’ Rhododendron ponticum, has become a severe problem throughout Scotland. It shades out other plants – and their attendant wildlife – and soon creates dense jungles which are not simply hard work, but also almost impossible, to clear. There a numerous projects afoot now to try and contain and clear these plants which are deadly to all other growth if left unchecked. Though I would have to say that the relatively new-kid-on-the-block, Japanese Knotweed, is now regarded as the world’s most invasive species. It’s found a foothold here and is spreading, and any plant that can grow up through concrete floors and bring down houses is definitely a real menace! Give me gorse spikes (and a pair of secateurs) any day!! 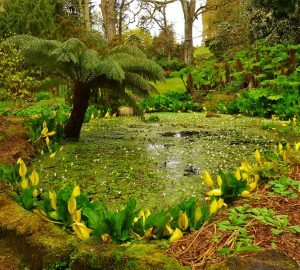 This entry was posted in Scotland, Travel, Writing and tagged American skunk cabbage, Arran, Brodick Castle, Gorse, Gunnera, Japanese Knotweed, Rhododendrons. Bookmark the permalink.